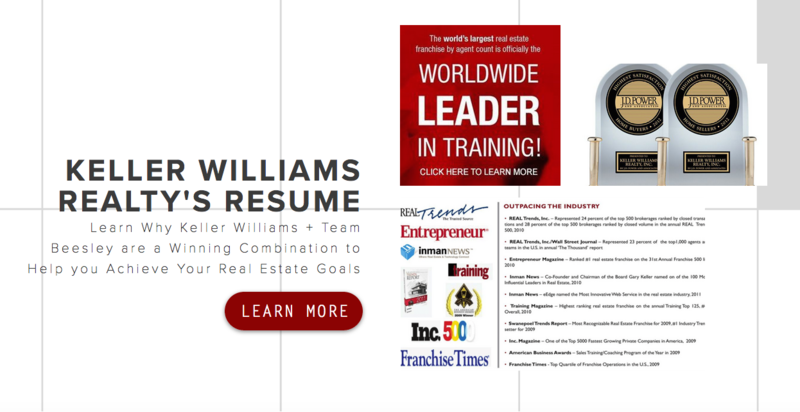 Keller Williams is not your traditional Real Estate company. That is why it is not surprising that it is the fastest growing real estate company in North America is #1 globally. Leading-edge tech tools and training give us the edge in effectively marketing your property online, 24 hours a day, seven days a week! Through KW’s exclusive Keller Williams Listing System (KWLS), your property is fed to more than 350 online search engines and available on KW’s Web network of more than 76,000 sites. Best of all, because of Keller Williams Realty’s “My Listings, My Leads” philosophy, every single Internet inquiry on your property will come directly to Team Beesley so that we can follow up quickly on potential buyers for your property. Keller Williams Realty was designed to reward agents for working together. Based on the belief that we are all more successful if we strive toward a common goal rather than our individual interests, We are confident that every Keller Williams professional shares the common goal of serving you, the client, in the best way possible. Keller Williams Realty helps Team Beesley stay ahead of trends in the real estate industry through its comprehensive, industry-leading training curriculum and research resources. It’s what prepares us to provide you with unparalleled service. Founded on the principles of trust and honesty, Keller Williams Realty emphasizes the importance of having the integrity to do the right thing, always putting your needs first. It reinforces our Team Beesley belief that our success is ultimately determined by the legacy we leave with each client we serve. We are proud to work with the largest real estate franchise in the World by agent count. It’s proof that when you offer a superior level service, the word spreads fast.